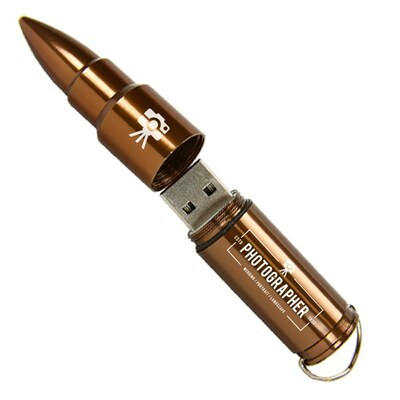 This custom USB drive is sure to hit a bull’s eye with any photographer! The Arsenal is a bullet-shaped flash drive. Made out of colorful and highly durable metal, this drive can be customized by engraving your logo or monogram on its side. They pack a powerful data storing punch, and make for a great promotional item or USB drive gift for any photographer looking to stand out from the pack. Our Arsenal custom USB drive hits the bullseye! This uniquely designed flash drive looks like a bullet. It’s a fun alternative to boring old business cards. Made out of gold, silver, or bronze colored metal, these custom drives are extremely durable. You can customize them by engraving your logo on its side. The Arsenal comes packed with data storage power, making it perfect for backing up your photos. Customize your Arsenal drive and it’ll be a great promotional item for any wedding, family, senior, corporate, or photojournalist photographer looking to get the word out about their business! They also make a great calling card if you’re working with shooting ranges, army surplus stores, the military, camping stores, or sport & hunting companies.